made my daily dunkin donuts stop and got a smoothie instead of coffee because i felt deprived of anything substantial. and let me tell you. i ordered a mango passion fruit smoothie. dont get the smoothies there. they are made of lard. basically, liquified lard. pureed donut lard. yuck. completely conked out on the train today... the only cool part of not feelin' so good? i get to wear my not-feelin'-so-good sunglasses. in other words, they're huge, they're dark, they take up half my face and make my nose look tiny in comparison. when i got to work, i realized i had a piece of melted chocolate stuck on the side of the frame. yeap! 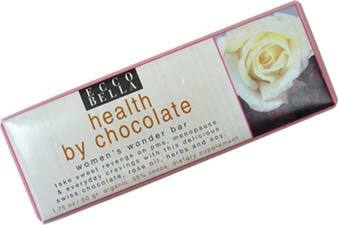 chocolate that is supposed to be good for you and make you beautiful. no kidding. there are three kinds of those, the one above, the one i got: instant bliss beauty bar, and one for healthy bones. the instant bliss beauty bar is supposed to contain antioxidants for beautiful skin. and i think it has a slight hint of blueberry in it. anyhoo, its pretty damn good for a crazy-idea-chocolate. i was expecting something more like those chocolate fitness bar things which taste like chocolate dust. yuck. if this beauty bar wasn't $4, i mightve cut hersheys out of my life altogether. Yes indeed, in some moments I can reveal that I agree with you, but you may be inasmuch as other options. to the article there is stationary a suspect as you did in the go over like a lead balloon a fall in love with issue of this request www.google.com/ie?as_q=guitar method in the style ?